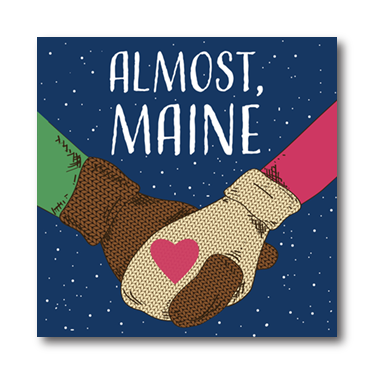 The Providence Players will be holding auditions for John Cariani’s Almost, Maine on Thursday, December 3rd and Monday, December 7th from 6:45 to 9:45 PM and the James Lee Community Center located at 2855 Annandale Road, Falls Church VA 22042. There are 19 roles in the play. It was written to be performed by four actors doubling the various roles. The play is structured as 8 vignettes with a prologue, interlogue and epilogue. With the exception of the pro, inter, and epilogues, no character is repeated in any of the vignettes so we will be doubling. I expect that each actor cast will perform in two, maybe three roles in two or so vignettes. This may change depending on how auditions go. I expect to cast 8-10 actors evenly divided, more or less between men and women. There will be roles for actors who can portray characters in their mid/late 20s to mid/late 30s and roles for actors who can portray characters in their 40s and 50s. This is an actor’s play with each role presenting unique and interesting challenges especially considering the characters appear in only one scene….a lot of role/character development in a short burst on stage…each character is its own “star turn” on stage. It is also a nice play to get involved with since the scenes are discrete and, at least in the early parts of our rehearsal schedule, not every actor will be needed for each rehearsal so the experience will be a little less intense than in many productions. Print AUDITION SIDES Only: Sides for the audition process will be supplied at auditions and are included in this announcement. Additional sides may be added at the auditions. Print AUDITION FORM Only: Resumes and headshots will be accepted, but are not required. Please ALSO COMPLETE the attached PPF Almost Maine Audition Form and bring it with you to the audition. Welcome to Almost, Maine, a town that’s so far north, it’s almost not in the United States—it’s almost in Canada. And it almost doesn’t exist. Because its residents never got around to getting organized. So it’s just…Almost. At 9 PM, one cold, clear Friday night in the middle of winter, while the northern lights hover in the sky above, Almost’s residents find themselves falling in and out of love in the strangest ways. Knees are bruised. Hearts are broken. Love is lost, found, and confounded. And life for the people of Almost, Maine will never be the same. A delightful, thought provoking, funny and entertaining set of interlocking vignettes that explore sudden love, love lost, love’s humor and both soaring and broken hearts. It is beautifully structured play and is sometimes realistic, sometimes absurdist and almost always magical. The author, describes the play’s subject as “falling in and out of love…but It is just as much about pain”. Amidst the humor and quirkiness, there is actually a fairly broad range of emotional context and content in the play that needs to be developed. The vignettes are intended to be presented as concurrent moments in time, one wintry Maine night. The people in the play are not caricatures. They are real people, basic and honest, and speak from the heart. As a director, I will treat them this way. They can be eccentric but the writing will convey that and it does not need to be overdone and won’t be. “Cute” will kill this play. It is inherently sweet and does not need to be sweetened at all. The multi-scene setting requires clever staging to promote flow and continuity while at the same time using the interludes to allow the audience to give each vignette it’s moment. There are 8 distinct vignettes with a prologue, interlogue and epilogue – the play generally runs 2 hours with intermission. There are 6 primarily outdoor settings and 3 “indoor” settings. There is no time for major set changes so that must drive the set design and staging. The magical nature of the play (and part of the “wow factor” potential of this production), I believe, is best emphasized with a basic setting of a vast wintry Maine expanse achieved though the creation of a snow scape of varying levels, with some trees, a big Maine “sky” and changing locations achieved through lighting, projection and gobos. The indoor settings will be achieved through either or both simple abstract set elements and lighting (“indoor” vs “Outdoor” lighting) and/or simple moving settings. Utilization of the whole stage will promote the feeling of different locations. The play calls for music transitions (the official soundtrack or other music TBD) that I would punctuate with a recurring Aurora Borealis lighting effect as a scene transition that should be quite captivating. 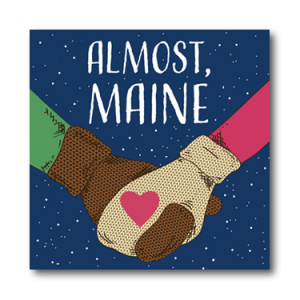 The Prologue of Almost, Maine introduces the only recurring characters in the play: Pete and Ginette (Have been dating awhile, in their 20s/30s Pete is an out of box thinker and Ginnette will do what she can to show Pete her love). The couple is sitting on opposite ends of a bench in front of Pete’s house in the town of Almost, Maine. After some awkward false starts, Ginette confesses her love to Pete. When Pete does not immediately return the sentiments, Ginette is flushed with embarrassment. Just when it seems as if things have gone terribly wrong, Pete admits his love as well. When Ginette comments on how close they are, Pete points out that the opposite is also true: if you measure the distance between them by going all the way around the globe, they are actually as far apart as possible. A bewildered Ginette starts to walk away from Pete to get closer to him. She continues until Pete finds himself alone on the bench. Scene 1, titled “Her Heart,” (East a repairman and Glory, a widow, a camper and broken hearted on a mission 40s/50s). opens outside of a farmhouse in a different part of Almost. A woman named Glory enters carrying a bag. The porch light comes on and East, the owner of the house, comes out to find out why there is a strange woman standing in his yard. Glory, who is not from Almost, explains that she traveled a very long way to get here and would like to camp out on East’s property. East is puzzled until Glory explains that everything she read about Mainers indicated that they were very open; therefore, she assumed it would be no problem to camp out on a stranger’s yard. As the two get to know each other, East suddenly kisses Glory and tells her he thinks he is in love with her. Glory is offended and informs him that she is in Almost to pay her respects to her dead husband, whom she hopes to see in the Northern Lights. East kisses her several more times, and with each embrace the bag gets passed back and forth between them. Glory reveals that the bag contains the pieces of her broken heart. East, a repairman, vows to put the pieces back together for her. As he begins to do so, Glory watches the Lights and says goodbye to her husband. “Sad and Glad,” Scene 2, (Jimmy – a heating and cooling guy, Sandrine (Jimmy’s ex engaged to another man and a waitress named Villian – 20s/30s). The two are estranged lovers who happen to run into each other at the back of a bar in Almost. Sandrine makes repeated attempts to get away, stating that her girlfriends are waiting for her. When she notices a mark on Jimmy’s arm, he reluctantly shows it to her. The tattoo reads “Villian” a misspelling of “Villain,” which explains how Jimmy feels about letting Sandrine get away. Sandrine finally admits she is here with her girlfriends for her bachelorette party; she is getting married the next day. As they part, the obviously wounded Jimmy tries his best to put on a good face. When he is alone, the waitress who has been waiting on Jimmy and Sandrine returns. She notices Jimmy is feeling down and tells him to call her if she needs anything. The scene ends with her mentioning that her name is Villian. Scene 3, “This Hurts,” moves the action to a laundromat, where Marvalyn and Steve (20s/30s) meet. When Marvalyn accidentally hits Steve in the head with the ironing board, Steve tells her he has a condition that prevents him from feeling pain. As a result, he keeps a journal of things that hurt so he knows to avoid them. As Marvalyn presses him about his unusual disease, Steve admits that he’ll never know what love is like because it hurts. Marvalyn spontaneously kisses him to test his theory. Although they are obviously attracted to each other, Marvalyn fears the reaction of her boyfriend, Eric, who doesn’t trust her to be out of sight for long. As she leaves, she accidentally hits Steve again with the ironing board. To their great surprise, Steve cries out in pain. Scene 4, “Getting It Back,” takes place in Lendall’s (20s to 40s+) living room. Lendall’s angry girlfriend, Gayle (20s-40s+), barges in bearing a heavy bag. She continues to bring in bag after bag, and she tells him the bags contain all of his love for her. She is fed up with their dead-end relationship and wants all of her love back in exchange for his. Lendall reluctantly presents Gayle with a very tiny bag, and she cannot believe that he loved her so much more than she loved him. When she finally looks in the bag, she finds an engagement ring. Lendall transformed her bags and bags of love into this ring, and the scene ends with the couple reunited. Scene 5, “They Fell,” finds two working-class guys, Randy and Chad (20s-50s), having a few beers in a potato field. After exchanging lousy date stories, Chad admits how happy his relationship with Randy makes him. Randy becomes uncomfortable and tries to change the subject. When Chad stands up, he abruptly falls to the ground and tells Randy that he “fell” in love with him. Randy angrily accuses Chad of ruining their friendship with his confession. Immediately following his tirade, Randy also falls. The two men repeatedly attempt to get to each other but continue to fall. In Scene 6, “Where It Went,” unhappily married couple Phil and Marci (40s/50s) have just finished an evening of ice skating. As Marci tries unsuccessfully to find her missing shoe, Phil asks her why she’s angry. Marci finally explains that it is their anniversary and Phil forgot. Both agree that it’s not working. When Marci’s shoe inexplicably drops from the sky, both take it as a sign. Marci drives off alone and leaves Phil to ponder their future. Scene 7, “Story of Hope,” shows the title character, Hope (40s/50s), arriving at a porch in Almost. She rings the doorbell, and an unfamiliar man (Daniel 40s/50s) answers the door. Hope explains that she was looking for a man named Daniel who asked her to marry him many years ago. Instead of giving him an answer, she left to travel and find herself. She desperately wants to apologize to him and thought he might still live in the family homestead. The man listens intently to the story and speculates about how slow and agonizing it must have been for Daniel. Finally, Hope recognizes the man as Daniel, who has been physically transformed into a figure half his original size because of all the hope he lost. Hope is just about to answer the question from so many years ago when Daniel’s wife, Suzette, calls from inside the house. Daniel and Hope part once again. In Scene 8, “Seeing the Thing,” friends Dave and Rhonda (most likely 20s/30s but maybe older) have just finished snowmobiling and arrive outside her shack of a house. Dave gives her a pointillist painting he painted for her. Dave confesses his love for her, but she tries to avoid his advances by trying to figure out the image in the painting. Rhonda, a tomboy, admits that most men don’t think of her romantically; she has never been kissed nor has she slept with a man. When Dave kisses her, she gives into their passion and the two comically remove numerous layers of clothing before heading in for the romantic liaison. As they exit into the house, the painting is finally revealed to the audience: a heart. Chip has served the company as technical director, lighting, sound, set designer, stage manager, production photographer, and, on occasion, has acted for the company. He remains active on the PPF Board and in marketing and publicity for the company. He has been nominated for more than 20 WATCH awards and is an eight-time WATCH award winner in a variety of production categories. As a director, Chip’s focus is on holistic, balanced productions with strong, tightly integrated production values and on ensuring that all involved have a great time working on the production. ← Have You Got Your Tickets Yet? “Snow White and the Family Dwarf” Opens Next Week on 12/11/15!